Other than ambulances, dump trucks, fire trucks, big trucks, buses and motorcycles, Tucker is really into Spiderman, aka "Spy-man." 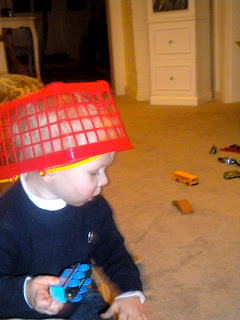 He put this grocery basket on his head and he came running to me and said, "Mommy, I spyman." 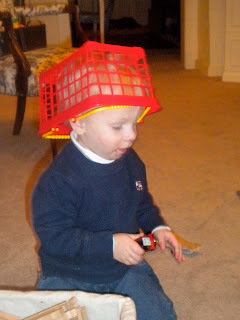 He would not take it off and continued to play for quite a while with the basket on his head. I tried to get a picture of him looking at me, but there was no time for that. I said "Tucker, look at Mommy and say 'Spiderman.'" No luck. 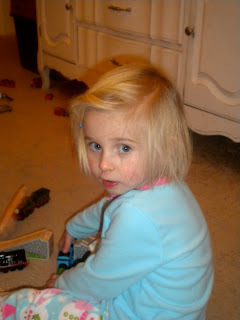 Instead, Caroline looked at me and said "princess!!!"